Fasten your seat belts and lock your car doors as “Drive” swerves into theaters at lightening speed. The mood is dark, the story complex and the performance by Ryan Gosling (“Crazy, Stupid, Love” 2011) is definitely award worthy. A cross between “Taxi Driver” and “Pulp Fiction”, the graphic violence will certainly not be to everyone’s taste. What the film does do, is stand on it’s own as a well directed and edited work by Nicolas Winding Refn. 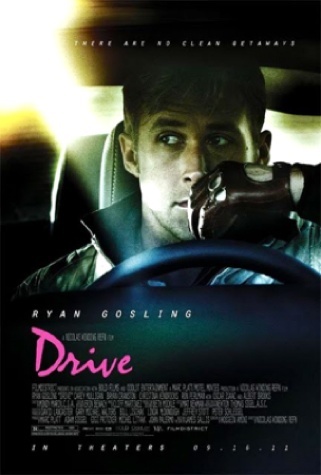 Driver, (Gosling’s character name) is a soft-spoken loner whose main profession is that of a Hollywood stunt driver by day and an intense get away driver by night. We also witness his icy heart slowly melting before our eyes, as he becomes gobsmacked by his married neighbor and her endearing son. “Drive” is a stylistic film noir genre that is shot in selected sepia tones, deliberately framed artistic compositions, dim lighting and is accompanied by a haunting musical score. The fast paced night driving shots of Gosling in his souped up Chevy Impala are riveting. These night scenes are reminiscent of “Taxi Driver” although the character is a thousand times more likable than Robert Deniro’s. Another film that came to mind is “Bullit”, particularly during the get away driving. My favorite car scene is when Driver steers agilely in reverse at rip-roaring speeds like it’s a piece of cake. The film begins with Gosling narrating in a rather hushed voice, “LA, the town of hundreds of thousands of streets and I know all of them, give me a 5 minute window and I’m there”. He continues talking about his car, informing us that he drives a Chevy Impala because it’s also the most popular car in the state of California and easily lost in a stream of traffic. Carey Mulligan (“An Education” 2009) co-stars as the somewhat lonely and vulnerable next-door neighbor. Yes, her husband’s away in prison, but whom is she going to call when she needs an adult to occupy her son on outings or help her with school emergencies? It’s Driver who picks up the slack and at the same time begins to care not only for the mother but for the boy as well. As you might surmise, everything changes when the ex-con husband returns home and his violent past becomes Driver’s problem. The only disappointment in the film is when a certain car is featured but never driven, I’m purposely being vague here as I don’t want to spoil the film for anyone. Clearly the title gives a clue to the film’s premise, but in actuality the theme becomes more about people, relationships and consequences. Bottom-line: Fast paced wild driving sequences, a film noir look, calm, cool performance by Gosling with violent blood filled screen action.